“Ek Mulaqaat”, is a conversation about love, life and literature and features the veteran actors Shekhar Suman and Deepti Naval. The play has been garnering rave reviews and running in theaters with sold out seats across India. “Ek Mulaqaat”, a Hindi – Urdu play about the intense relationship between celebrated Urdu poet Sahir Ludhianvi and acclaimed Punjabi author Amrita Pritam. In today’s times of frantic messaging and consummation, the relationship between the two stands out as a symbol of dignity and pathos in love. The play, directed by Saif Hyder Hasan, is infused with literary references, nazms and poetry of the legendary duo.Saif brings with him wealth of experience having written two books, ten plays and directed many which have been staged to public and critical acclaim. His book ‘One Yesterday’, a compilation of memoirs was published by Rupa & Co in 2004. In 2007, Saif was part of the jury of Classmate Young Author Contest 2006. The panel was headed by Ruskin Bond. 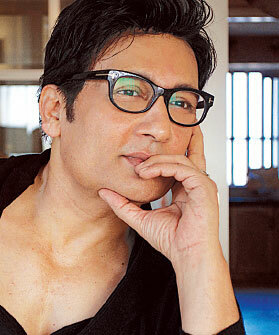 Returning to the theatre after a long illustrious career in television and as a Director is actor Shekhar Suman as Sahir Ludhianvi. He made his debut in the movie Utsav alongside Bollywood bigwigs Shashi Kapoor and Rekha. On television, he was featured in the shows Dekh Bhai Dekh, Reporter, Kabhi Idhar Kabhi Udhar, Wah Janab, Chote Babu, Andaz, Amar Prem ‘Aaha’, Vilayati Babu, Movers n Shakers, Simply Shekhar and Carry On Shekhar. The last three were primarily modeled on and adapted from The Tonight Show with Jay Leno. Sharing the stage with Shekhar Suman is actress Deepti Naval as Amrita Pritam. She is an Indian American actress who has worked in over 70 Hindi films. She has most often worked in art-house and independent films, known as parallel cinema in India. She is best known for her acting in films like Chashme Baddoor (1981), Mirch Masala (1985), and more. She has also acted and directed television serials. ← ENJOY IFTAR- THE EATALIAN WAY!